Here is a recipe for Eggnog Cookies that you can make quite easily. They are pretty, and there is no piping involved, so you can leave your decorating bag in the cupboard for another time. I used mace when making these cookies. Mace is the lacy outside of the nutmeg shell, and nutmeg is the seed inside. Mace is slightly more pungent than nutmeg, and both work beautifully in this cookie, so use what you like. These cookies are grain, dairy, egg and nut free, and a great cookie to make when you have friends and family with food sensitivities and allergies like myself. Preheat the oven to 350º degrees F. Lay out a parchment lined cookie sheet. 16 Teaspoons of Coconut Butter for the Thumbprints after baking. Whisk together the Coconut Flour, Baking Soda, Sea Salt, Mace and Gelatin in a mixing bowl. In another medium microwave safe bowl, add the coconut butter, maple syrup, olive oil, vanilla and rum. Warm the liquid mixture in the microwave for 30 seconds, then with a hand held electric mixer, beat until smooth and creamy. If the coconut butter isn’t softened enough, microwave another 30 seconds. Add the liquid mixture to the dry and beat with your electric mixture until you get a soft crumb consistency. This next step will activate the gelatin and make a natural egg replacement. Place the coconut milk in a microwave safe glass measure. Microwave to a boil, but be careful not to boil it over. This is different depending on the power of your microwave, but about one minute to one minute thirty seconds. You can also do this on your stove top. Now with your mixer running, pour in the coconut milk, beating as you go until the milk is all incorporated, and you have a nice dough. With a tablespoon scoop, scoop the cookie dough onto your parchment lined cookie sheet. Press a thumbprint into the center of each cookie, and bake for 10 to 12 minutes until just turning golden brown on the edges. Remove from the oven. Melt 16 teaspoons of Coconut Butter in the microwave, and with a teaspoon, pour the coconut butter one teaspoon each into the indentations of the cookies while they are still warm. Sprinkle with a little additional mace or nutmeg. Cool completely. With the holiday season, along comes cold and flu season. 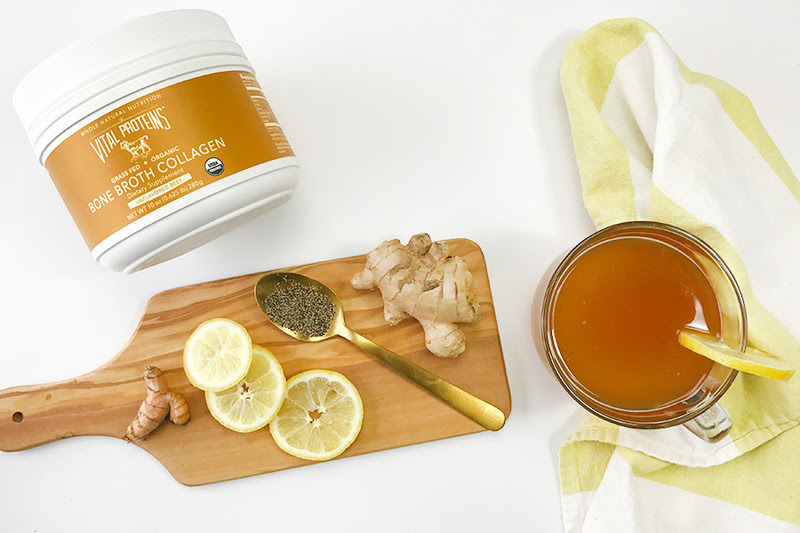 Take charge and boost your immune system with Vital Proteins’ Beef and Chicken Bone Broth Collagen Powders. Your family will thank you! 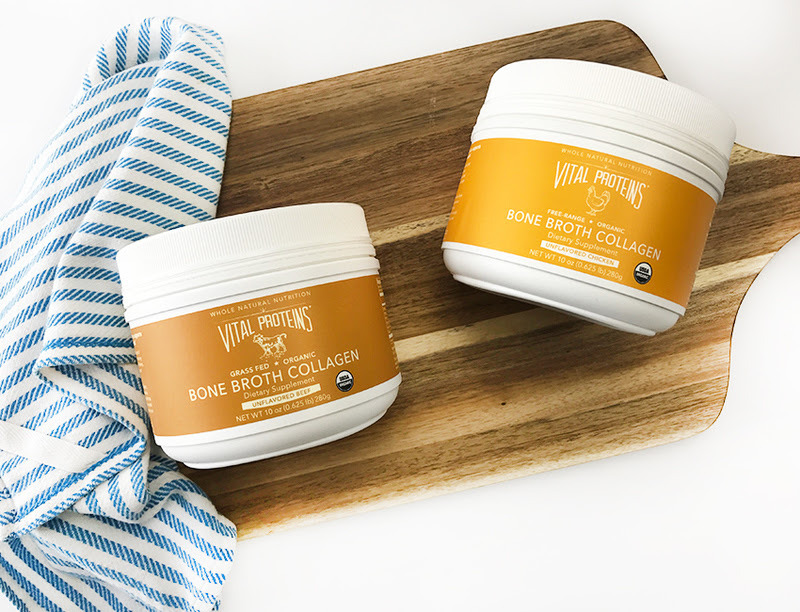 Vital Proteins’ Bone Broth Collagen Powder is crafted with USDA Organic bones that are simmered slowly to extract the maximum amount of nutrients. The bones are either sourced from grass-fed, pasture-raised cattle or free-range chickens, and offer 9g of protein. Vital Proteins Beef and Chicken Bone Broth Collagen powders are the first of their kind. Perfect addition to warm beverages, stews, soups, and more. Add all ingredients into a pot. Bring to a boil. Remove liquid from heat. Strain. Sip and savor. (1) Rennard, Barbara O., Ronald F. Ertl, Gail L. Gossman, Richard A. Robbins, and Stephen I. Rennard. “Chicken Soup Inhibits Neutrophil Chemotaxis In Vitro.” Chest118.4 (2000): 1150-157. Web. Vitamin D deficiency is high, especially in the winter months. It is estimated 50% of people are deficient. I have my vitamin D levels tested every year. There are three ways to get vitamin D…..UV light (sunlight), food, and supplements. My levels go up during the Summer, because I am outdoors so much, and they also gets very low in the winter months, so my doctor has me take a supplement. It is a good idea to get your vitamin D levels tested by your doctor, include foods rich in Vitamin D in your diet, and supplement if needed with Vitamin D3. You should not do this on your own, because you can get too much Vitamin D. Vitamin D is supportive to our immune systems, aids calcium absorption, and cardiovascular health. It is a hormone, not a vitamin, and is necessary for our immune systems to function properly. The top food sources in order are, maitake mushrooms, swordfish, sockeye salmon, chanterelle mushrooms, canned tuna fish, fortified orange juice, milk and egg yolks. Learn more in this detailed research article on the best Vitamin D supplements by reviews.com here. Reviews.com gives you information on how to get tested, the importance of third party testing when choosing a supplement, and their top picks. Here are some recipes to get in some Vitamin D rich foods as well! I do not get paid to give this advice on Vitamin D.
This flavorful, nutrient rich, salad with chopped radicchio and oven roasted broccoli is a delicious mixture of crunchy, sweet and salty. The salad is tossed with apple juice sweetened cranberries, salty bacon and is drizzled with a honey lemon vinaigrette. The colors are bright and vibrant, and it keeps well in the refrigerator for three days. Radicchio originated in Italy, and gives the salad a pop of color as well as phytonutrients, flavonoids, vitamin c, k and b vitamins. It has a bold flavor and looks similar to red cabbage, but is nothing like it other than color. It is a member of the chicory family. Broccoli is a vegetable in the cruciferous family and is full of nutrients. At the top of the list is vitamin k, c, chromium, folate and many more. This is a really delicious and eye catching salad! Preheat your oven to 400º degrees F. Toss the broccoli florets in the oil and sea salt. Roast in your preheated oven in the center rack for approximately 25 to 30 minutes until crispy and brown. They will be almost like a chip. They should be golden brown and crispy on the edges, but not burned. Meanwhile, place your washed and shredded radicchio into a large bowl and make the vinaigrette. Directions: Whisk together all the ingredients until emulsified. Pour the dressing over the radicchio. Pour the prepared dressing over the top and toss to coat thoroughly. When the broccoli is done, place it on top of the dressed radicchio while it is hot. Add the cranberries and crumbled bacon. I like to serve it layered like this with a long set of salad tongs. That’s it! It’s ready to serve, and as I said, this salad stays fresh in the refrigerator for several days. The radicchio is a sturdy leaf and doesn’t wilt or get soggy with the vinaigrette added to it, and the flavors just get better.